Manic Street Preachers bassist, Nicky Wire, is at the centre of yet more controversy following remarks he made at the band's show at Kilburn National on Friday (December 11). About 10 minutes into the set, he told fans, "I hope Michael Stipe goes the same way as Freddie Mercury". (There have been persistent rumours that the R.E.M. singer is suffering from AIDS, although Peter Buck recently told The Maker that all four members of the band he’d tested negative for HIV). At the after show party at the Billboard Cafe, Wire was surrounded by angry journalists, and a number of protesters were ejected after scuffles broke out. This isn't the first time Wire's onstage behaviour has caused problems. At February's Astoria gig, he attacked a Japanese cameraman with his guitar, and at August’s Reading Festival, a security guard was hospitalised when Wire threw his smashed bass into the crowd…and missed. Nor is it the first time the Manics have used extreme statements to make simple points: Richey once claimed he hated Slowdive more than Hitler and, at June's Town & Country Club show, Wire said he wished the Princess Of Wales had made a better job of her suicide attempts. "Just because Stipe's some kind of poet-rock singer, he's some untouchable, sacred cow." “Place your hand on your heart. If we'd wished for the immediate death of Prince Edward, John Major or Margaret Thatcher, would you have been offended? Or would you have laughed? Probably: a Ben Elton laugh for the right-on liberals among us. So why is the death of a pop star more disturbing than the death of a Prime Minister? Because he's a star in your own industry? As for Freddie Mercury, did anyone at Melody Maker or NME give a f*** about the man before he died? And AIDS itself is unmentionable, it's got to be so hush-hush." “But it's not a homosexual disease: it's a sexual disease. When 30,000 miners lost their jobs, they didn't have any choice in the matter. With AIDS, you do have a choice: don't be promiscuous, use a condom, don't put a needle in your veins." 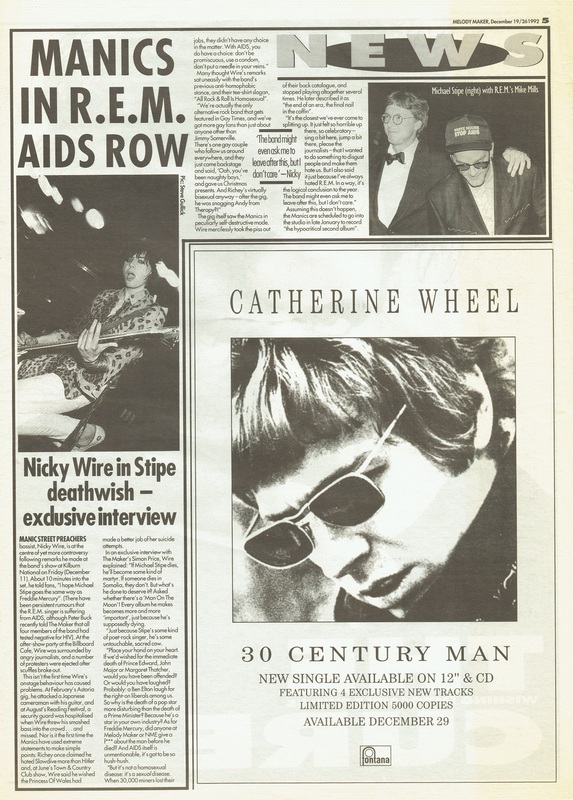 Many thought Wire's remarks sat uneasily with the band's previous anti-homophobic stance, and their tee-shirt slogan, "All Rock & Roll Is Homosexual". “We're actually the only alternative rock band that gets featured in Gay Times, and we've got more gay fans than just about anyone other than Jimmy Somerville. There's one gay couple who follow us around everywhere, and they just come backstage and said, 'Ooh, you've been naughty boys,' and gave us Christmas presents. And Richey's virtually bisexual anyway - after the gig, he was snogging Andy from Therapy?!" The gig itself saw the Manics in peculiarly self-destructive mode. Wire mercilessly took the piss out of their back catalogue, and stopped playing altogether several times. He later described it as "the end of an era, the final nail in the coffin". Assuming this doesn't happen, the Manics are scheduled to go into the studio in late January to record "the hypocritical second album". This page was last modified on 26 March 2018, at 17:18.